Alex Lloyd Gross-Photo- Delaware Valley News.com Sal D’Amico and Joel Allinson camp out in Bensalem. Chick- Fill- A is opening a new location in Bensalem tomorrow November 29, 2018.on the 1400 block of Strreet Road. Tonight, a handful of people are camped outside in the parking lot hoping to be one of the first 100 people in line. Those lucky people will get 52 free meals for a year. People like Sal D’Amico from Middletown who was in the lot with his friend Joel Allinson, . They set up a tent and were there since 5:10 AM. The two men had their tent destroyed by the weather but intend to stick it out. “It’s a great Facebook story,” laughed D’Amico. He slept out previously for a NY Yankees World Series and some Black Friday sales. Other people like Alex Gidinski of Northeast Philadelphia brought a lawn chair with him. He is bundled up and ready to brave the elements. He has no tent. Code enforcement had paid a visit to this promotion and shut down anyone using a propane heater. Some people gave up and left. The line gets cut at 5:00 AM. or when 100 people sign up. The front parking lot is roped off. Contestants must stay in the roped off area . They cannot return to their vehicles and run home. If they do, they are disqualified. at 6:00 AM the winners will be given a card for a free meal. Alex Lloyd Gross- Photo- Delaware Valley News.com With no tent, Alex Gidinski sits in his lawn chair, bundled up from the cold. If he can stick it out, he will get 52 free chicken meals during the course of a year. 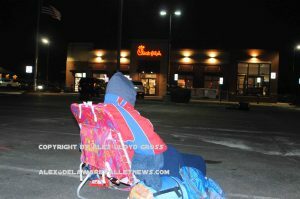 The Chick-Fill-A is giving the contestants free food and hot coco while they are there. The restaurant is a franchise owned by Jonathan Marple. “I started as a team member for $9.00 per hour, knowing full well this is what I wanted to do. i wanted my own place. I was told it was an uphill battle. They have 40 thousand applications for a franchise,” he said. Chick-Fill-A chose the location, built it from scratch, after a failed Sonic was torn down. “We brought 110 jobs to this area,” Marple said. While some fast food places scoff at paying help more than $8.00 per hour, this place get it right with a starting wage of $11.00 . “We don’t approach this with the idea of what can we get away with paying, but how can we invest in our team, we pay a livable, fair wage,” Marple said. He is spot on. With higher wages, goes more employee loyalty, and less turnover. He brought his wife Allysn on board to help with promotions and whatever is needed. Emergency responders in uniform get half off. The hours are going to be 6:30 AM to 10:00 PM. Applications for work are still being accepted and due to the weather, there are some spots left in line for the promotion. You must be in line by 5:00 AM. The promotion cuts off when 100 people show up. This is a tradition for the chain. .
Alex Lloyd Gross has the reputation for aggressive news coverage. With over 40 years experience including working at The News Gleaner, and had his work published in books and magazines that span the entire globe. With a strong background in emergency service related topics, he can bring forth a perspective that others cannot. A contributor to Starfile Photo Agency for 20 years, Alex has been given access to and has photographed luminaries of both stage and screen. He now shares his talent with you.